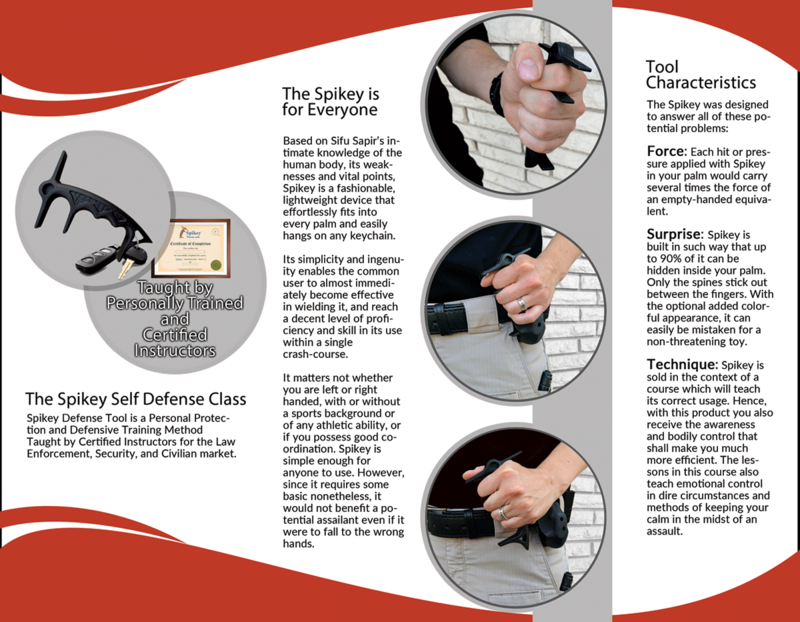 THE SPIKEY™ IS A SELF DEFENSE DEVICE FOR CONVENIENT PERSONAL SECURITY. Based on a proven self defense technique and “real life” experience, it enables any user to fend off any aggressor, including sexual assault and violent attacks. The SPIKEY was developed in Israel, and is used by both the Israeli police force and the Israeli Defense Force (IDF). The innovator of the SPIKEY, is Sifu Master Sapir Tal. He has instructed several law enforcement agencies in New York and Texas. In the state of Illinois there are only four certified instructors taught by Sifu Tal. Sensei Peter O’Malley is one and he is a 2nd degree black belt in Go Ju Karate and Aikido. Peter has been in the martial arts over 30 years having trained law enforcement, security, military, and civilians. Peter owned a martial arts dojo and has instructed at the Cook County Sheriff’s department. Peter is a certified SPIKEY instructor for civilian and law enforcement, having completed the certification with the Israeli master.